Reggie Jones can sum up Emeka Egbuka‍ simply. “Emeka is special,” the Founder/CEO of Heir Football Academy says of the 2021 Washington wide receiver. Egbuka certainly seems well on his way to being in that conversation. 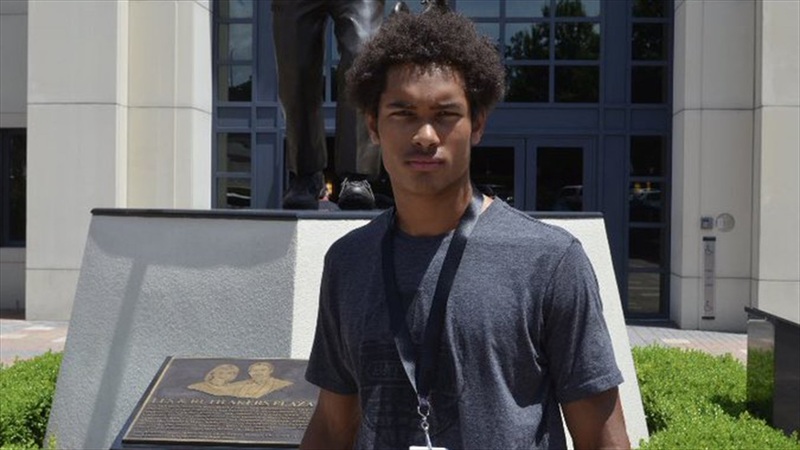 The Steilacoom High School star already has dozens of offers from schools like Notre Dame, Washington, Oregon, Stanford, USC, Ohio State, Michigan, Penn State, Alabama, LSU, Oklahoma, Texas A&M, Florida State and Tennessee among others. Egbuka will be at Notre Dame on Thursday along with Jones and fellow Heir Academy athletes Kasen Kinchen and Donovan Clark. Jones said the first things he saw with Egbuka was his size and work ethic. Jones, who spent time in the NFL as a cornerback with the Saints, Redskins and Vikings, says Egbuka could play running back, safety or even cornerback at the next level, but believes his future is at wide receiver. “He’s one of those athletes that doesn’t come around very often,” he says. “I think he’s going to make his mark as a receiver because his route-running ability is far beyond his years. Off the field, Jones says Egbuka can be quiet, but is pretty funny once you get to know him. “You start to see the quirky sophomore,” says Jones. “He’s cracking little jokes...but when you look at his physical frame, you’re like, ‘This kid is a man.’ He’s a humble young man, he’s well-spoken. “Understanding when people need a spark, you’re the one they’re going to look to,” he says. Jones says Egbuka is in the early part of researching his growing list of options. “Emeka is going down the list right now, looking at these top programs and filtering out where he wants to go when it comes down to his five to take his officials and know, ‘I want to take a look at this school more in-depth,’” says Jones. And South Bend was an easy choice for the itinerary, according to Jones.